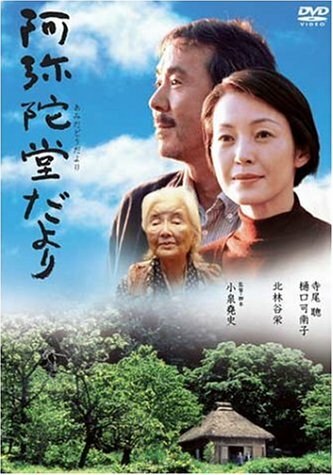 As the film begins, Takao (Akira Terao) and Michiko (Kanako Higuchi) have already pulled up their Tokyo roots and moved to a village that is Takao's ancestral home. They visit a thatched cottage that serves as a memorial shrine (amidado) for the village dead and chat with the attendant, the spry 96-year-old Oume (Tanie Kitabayashi). Together they admire the view -- from an inspiring distance. Oume, it turns out, is a kind of sage, whose thoughts and observations are a popular feature in a column in a local newsletter. Her amanuensis is a mute, sweetly smiling young woman named Sayuri (Manami Konishi), who is as devoted to Oume as Oume is to the souls of her beloved dead. Takao also reunites with Koda-sensei (Takahiro Tamura), his beloved junior high-school teacher, now retired, who spends his day beating the futon with his wooden sword or practicing calligraphy in his tastefully decorated Japanese-style house, overlooking a picture-perfect Japanese garden. He and his devoted wife, Yone (Kyoko Kagawa), are always dressed elegantly in Japanese-style clothes and never touch anything electronic.